The Denver Nuggets went into a hostile playoff atmosphere knowing what was at stake. 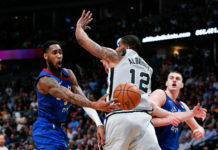 Denver came away with a 134-115 road victory against the Los Angeles Clippers, a result that eliminated Los Angeles from playoff contention while also keeping Denver’s own playoff hopes alive. Denver got its scoring from a variety of sources yet again, with Will Barton leading the way with 31 points (11-for-15 from the field). Nikola Jokic netted 23 points, 11 rebounds and 11 assists, while Jamal Murray pitched in 19 points and seven assists. Seven players scored in double-digits for Denver. The first quarter saw the two sides feeling one another out early, but after that initial period Denver found its rhythm. They started out the game 9-for-11 from the field and jumped out to a 19-13 lead. It built from there, as Denver led 33-26 after the first quarter. The second quarter saw its share of runs. Denver started out on the right foot, but a 5-0 push got Los Angeles within seven. From there, the Clippers got a few stops and got it to 54-58 before Denver made a run of their own that pushed their lead to 66-58 at the half. Barton led all scorers at the midway break with 16 points on 7-for-9 shooting from the field, including two 3-pointers. Jokic had 15 points, four assists and seven rebounds at the half on 5-for-6 shooting and kept Denver afloat with some timely and-one possessions. Paul Millsap didn’t have an exceptional first half, but still finished with 11 points. One thing that stood out at the half was Los Angeles’ aggressiveness on the offensive end. They went to the free-throw line 29 times opposed to Denver’s 14, yet somehow Denver was up 40 points to 26 in the paint. 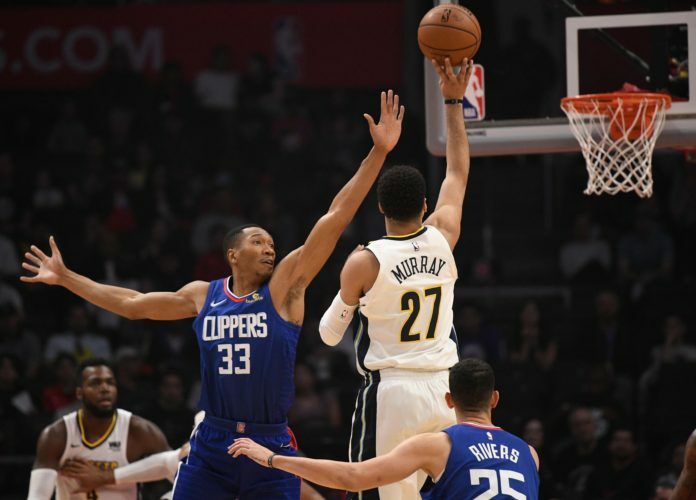 The third quarter started out with a Barton 3-pointer in transition that summed up what the quarter looked like for Denver, outscoring the Clippers 35-31. 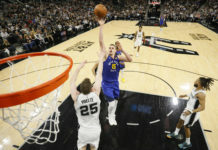 Jokic had recorded his ninth triple-double of the season before the period ended. Denver was up 101-89 at the end of the third, while the Clippers’ playoff hopes were taking on water. The fourth quarter was smooth sailing for Denver as they built on their third quarter lead and led by as many as 21 points. 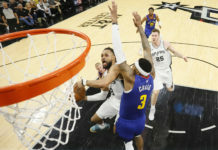 They won the quarter 33-26 and closed out a near must-win game, earning their fifth straight victory over the Clippers. With the win, Denver improves to 45-35 on the season and in doing so moved closer to making the playoffs. With Denver playing so early in the day, they remaining in ninth place in the Western Conference and will have to wait to see how the late-night games play out to see if they’ll be back in the playoff picture by the end of the night. Denver has just two games remaining, the first against the Portland Trail Blazers on Monday. What is setting up to be the game of the year comes on Wednesday in Minnesota. That game could decide who is in and who is out for the final playoff spot, but with a massive win on Saturday afternoon Denver remains in control of their own destiny.